New variety! 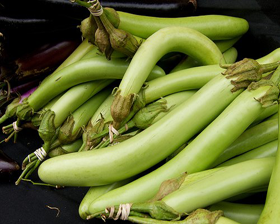 This oriental-type light green long eggplant is absolutelly bitter-free with very delicate, tasty cremy flesh. Vegetation period is 115 days. Fruits weight 225g. Sow seeds February-April for growing indoors. March-May for growing outdoors. Sow seeds on the surface of a good free draining, moist seed compost and cover with 6mm layer of vermiculite or compost. Place in a propagator or seal container inside a polythene bag at constant 18-21C until germination which takes 10-14 days.